In journalism classes we teach the balance imperative. Get both sides of the story. But as journalism critics we acknowledge that being balanced doesn’t mean the story always gets told. The first dilemma is that most stories, like life, are more complex than simply showing “two sides.” Years of observation have led me to conclude that not all sides deserve equal time. 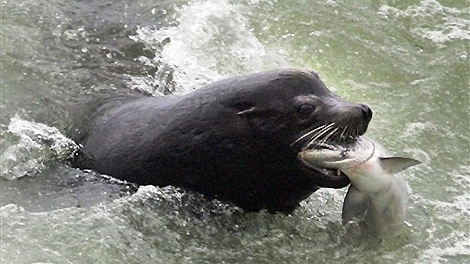 An example continues to loom on the horizon as Native tribes, nontribal governments, fishers and interest groups debate how to deal with the sea lions feasting on salmon at the Columbia River. Over the last five years news coverage has centered on the views of state and federal governments and courts, juxtaposed with views from animal rights groups. Government scientists want to get rid of the sea lions while animal rights groups oppose their removal. We only hear from Native tribes occasionally but I argue that Native voices are fundamental to understanding how we manage the river. A recent study examined who speaks to the conflict in news reports and found that government sources are quoted four-times more than any other source, starting with advocacy sources (animal rights groups and fishing groups). But tribal sources get half as much attention as advocacy groups. Point is that tribal sources are largely ignored. The study is the subject of a graduate thesis Tess McBride finished in the spring at Portland State. Tess points out that the balance imperative is lopsided: governments, which favor sea lion removal, have a greater opportunity to make their claims compared with other groups. And while this bodes well if your views align with the government agencies, it also demonstrates the lopsidedness of reporting. The most interesting finding, however, is the use of blame frames. When newspapers reported on failures of managing the sea lions, the government sources took a back seat to the advocacy groups. In other words, the Humane Society and advocacy organizations were better equipped to set the agenda when it came to screw ups. And the balance imperative was ignored again. The Humane Society received more ink when protesting the decision to remove sea lions from the river. Being loudest may not make you right, but it results in more press. This entry was posted in ethics, framing, journalism, science, science communication and tagged Indigenous Science, science, stereotypes. Bookmark the permalink. Contrast/compare that with the wolf issue in eastern Oregon. I have not heard a peep out of the “Humane Society” fighting against the killing of wolves in our state. Do they think it is more important to protect imported cattle more than a wild native species? Sea lions are no more prescient than a wolf. Both are very smart and will take advantage if given the opportunity as we all likely would.